Sized as shown in the right hand photo. These are very small eyelets in black enamel. Just eyelets - no backing washers needed with this style of eyelet. Won't go through much leather, just the thin stuff, but great for use on paperboard. Sized as shown in the right hand photo. These are very small eyelets in a gunmetal finish, which is dull gray. Sized as shown in the right hand photo. These are aluminum eyelets with a reasonably shiny surface. Just eyelets - no backing washers needed with this style of eyelet. Handy little doodads for lacing up the things in your life that need lacing up. Like boots, mocassins, fly rod cases, custom-made chaps, etc. These short-shank eyelets are just right for setting in 3 to 6 oz leather. You'll need an eyelet setter to place them correctly. You can find that tool in our Tool section. Tube length is 3/16", outside diameter of top flange is 3/8", inside dia. is 7/32" Sold in packs of 100. Free shipping to any USA location. Slightly duller in appearance than EYE-111 (sold above), these have 3/16" tubes. Sold in packs of 100 for $6.00, and this price includes shipping to any USA location. 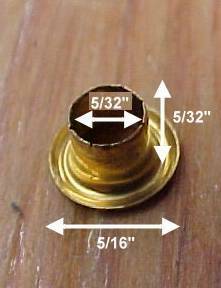 This is a bright brass very small eyelet, with dimensions as shown. Sold in packs of 100 for $6.00, and this price includes shipping to any USA location. Yup, like the ones on your old hiking boots, these brass-plated steel lacing eyelets have a hexagonal shaped head that's 1/2" across. These have 3/16" tube length and 3/16" tube inside diameter. EYE-107 Sold in packs of 50 for $8.00, and this price includes shipping to any USA location. Same as the brass eyelets sold above, these are best used for total leather thicknesses of 3 to 6 oz (3/64 to 6/64 of an inch, Jasper). These are aluminum eyelets with a brown enamel finish on the top surface. Just eyelets - no backing washers needed with this style. These have a flange diameter of 5/16", inside diameter of 1/8", and tube length of 3/16"
Doesn't get much more exciting than that. Around here anyway. Vented Eyelets - When You Need to Release Pressure! These are really cool air vents for your sneakers, your purse, or your dive bag. Set them like eyelets - they're made of brass and roll down easily. White Vents DO NOT come with washers (burrs) for the back. Set them without burrs or buy some at the hardware store. These have a tube diameter of 3/16" and the tube is 3/16" long. 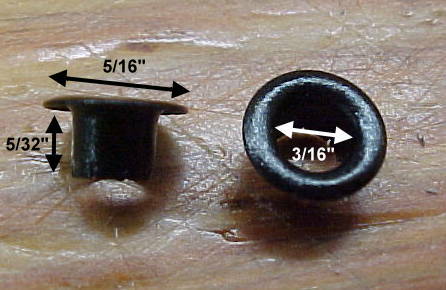 The vented cap is 11/32" in diameter. These grommets are steel with an antique brass finish. 1/4" inside diameter, with a total flange width of 1/2". The tube is 3/16" long. You'll need a grommet setter to roll the tube down properly - you can usually pick one up in the hardware store or near where they sell tarps in a department store. These grommets are nickel with typical silvery finish Photo shows EYE-112N on the left, EYE-112AB on the right.. 1/4" inside diameter, with a total flange width of 1/2". The tube is 3/16" long. Cast nickel grommets have an inside diameter of 3/8"
ALERT! OUR CURRENT SETS CONTAIN NICKEL-PLATED GROMMETS- SILVER! NOT GOLD COLOR! as you rip open the package. Finished grommets in this kit are 15/16" in diameter. 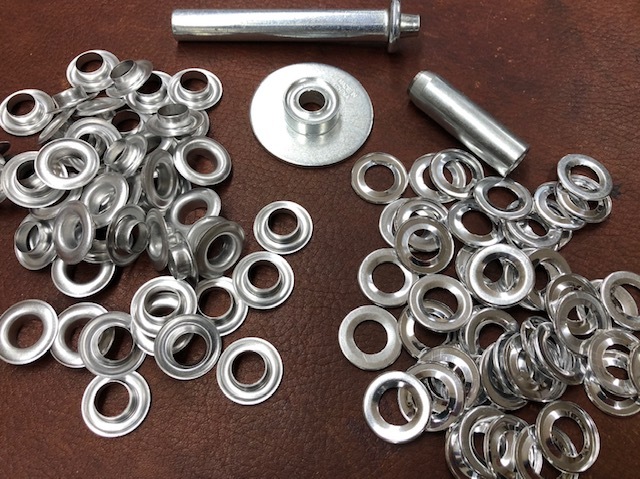 NICKEL Grommet Setting Kit $18.00, USA shipping included. Nickel plated lacing loops/hooks/rings have small triangular rings to run your laces through. EYE-106 Sold in packs of 20 for $8.00, and this price includes shipping to any USA location.